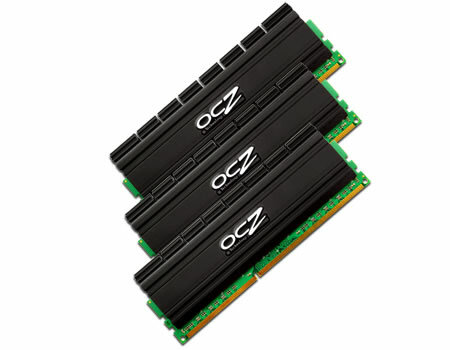 The OCZ Blade Series Triple Channel Memory kit is designed specifically for the Intel Core i7 processor / Intel X58 Express Chipset. At DDR3-2000, CL 7-8-7, the OCZ Blade Series harnesses industry-leading speeds at the low voltage required to safely run Core i7’s triple channel mode. The Blade heatspreader aims to enhance heat dissipation to improve the longevity and stability of the modules while keeping a sleek, low profile. The new propriety design has numerous channels that increase the surface area to more efficiently offload heat away from the memory chips and PCB. With the ideal combination of all the factors that formulate the ultimate memory solution— density, speed, latency, and an effective new cooling design—the OCZ Blade Series is guaranteed to please enthusiasts looking to take the hottest Intel platform to new heights.